The Church Town of Gammelstad in Nederluleå (today a UNESCO World Heritage). Photo: Carl Gustaf Rosenberg, 1940s. The Swedish National Heritage Board has launched a new image album on Flickr Commons, with photographs by the Swedish photographer Carl Gustaf Rosenberg. During 2019, we will show and share a choice of his images, mainly from the 1940s. The Swedish photographer C. G. Rosenberg (1883-1957) was a technically skilled photographer, with a special sense for the motives and the light. His specialities were landscapes and architecture, but people also appear in his images, which will show in the Swedish National Heritage Board’s photostream on Flickr Commons and the new album Carl Gustaf Rosenberg. He was born in Paris in 1883, son of a Swedish artist and painter. When the family later returned to Sweden, he became interested in photography during his years at high school. After graduating, he went to New York where he was trained as photographer in 1904-1905. Back in Sweden and Stockholm in 1906 his career started, and he began photographing for different Swedish magazines. In 1922, the Swedish Tourist Association – STF – engaged him as a photographer for their annual book about Sweden; a mission he kept for 35 years. He was also a skilful photographer of architecture, frequently engaged by the leading Swedish architects of the time. 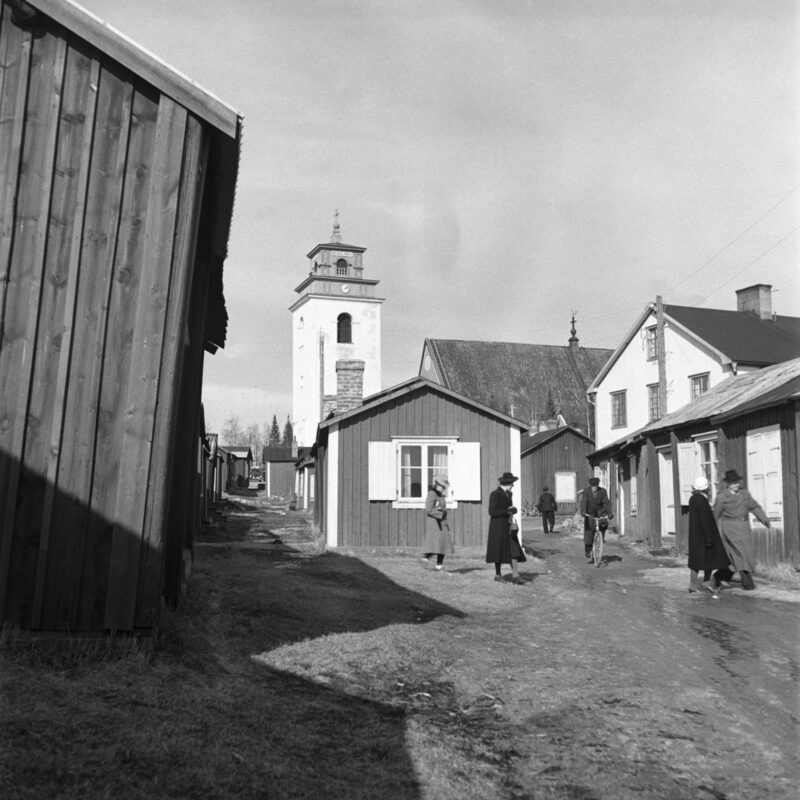 The archives of the Swedish National Heritage Board hold about 3,000 black and white photographs by C. G. Rosenberg, most of them from the 1940s. They are from all parts of Sweden and show landscapes, towns, ancient monuments, buildings and industrial environments, but also people. About 840 images from the collection are digitized to the Board’s photo database online, Kulturmiljöbild, and this year, we will present a choice of the images on The Commons. As always, we hope for your help to give us more information about the images, in your comments and tags. You are Very Welcome to the Swedish National Heritage Board’s photostream on Flickr Commons to view and enjoy, download, use and share Carl Gustaf Rosenberg’s images from Sweden in the 1940s! 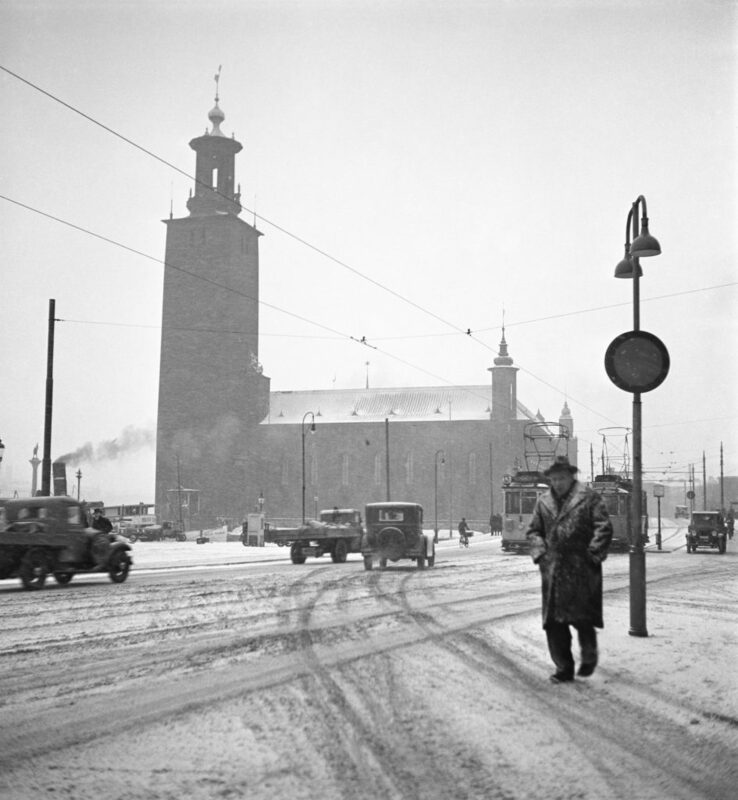 Stockholm City Hall in snow. Photo: Carl Gustaf Rosenberg, 1940s. 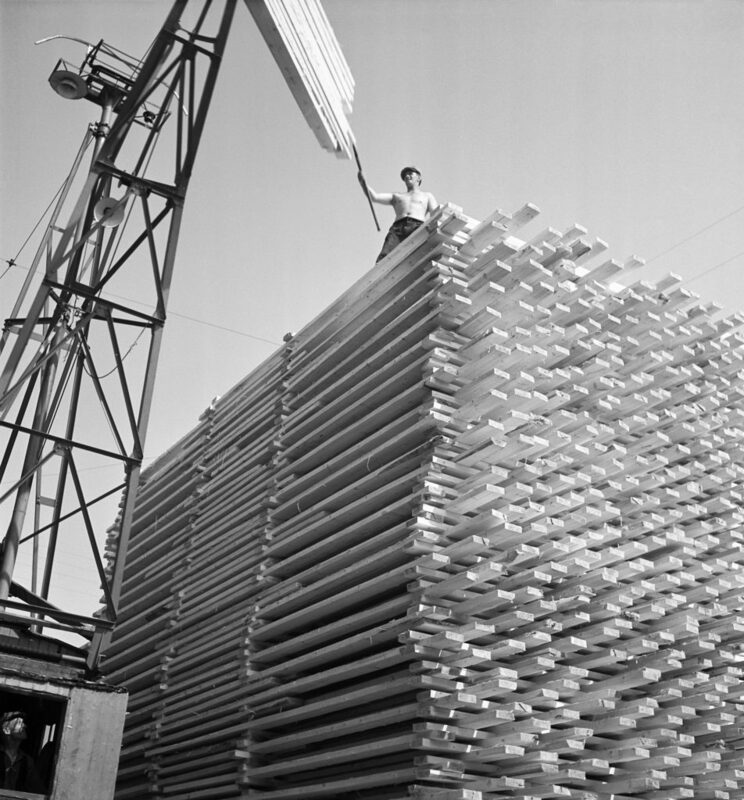 Fredrik Bruno – back on Flickr Commons! Kungsgatan street in Stockholm City, Sweden. Photo: Fredrik Bruno, 1944. Three years have passed since the Swedish National Heritage Board presented Fredrik Bruno and his 1940s colour photographs on Flickr Commons. Since the images have been largely appreciated, we thought it would be nice to renew the acquaintance and show some more of these photos from different towns around Sweden (and some from the countryside), taken with either Kodachrome or Agfacolor diapositive film. Being a professional town engineer, Fredrik Bruno obviously focused on urban motifs. A lot of the photos might even be from travels he made in his service. When we first started the Fredrik Bruno collection on Flickr Commons in 2011, (read on our blog) we divided it in two albums, one with photos from Sweden, the other with photos from Norway. This time we will only upload photos from Sweden, because of a larger number to choose from. Some of the photos we show have a link in the field of information to a recent photo in our photo database, showing exactly the same view, but in 2010-2011. 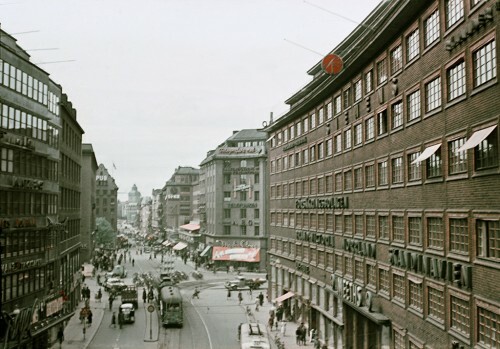 These comparative photos were taken within a project at the Swedish National Heritage Board, with the purpose to illustrate changes in the urban environment over time. It would be just great to see some of your own comparative photos posted in comments! Welcome to to enjoy the 1940s in colour, in our photostream on Flickr Commons or in the album “Fredrik Bruno – Sweden”. 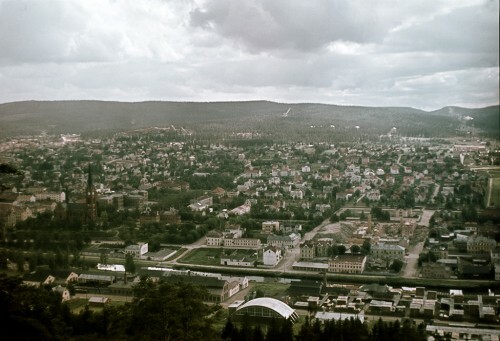 View of Sundsvall town in Medelpad, Sweden. Photo: Fredrik Bruno, 1944. 200 000 visningar på Flickr! Jag har ”Flickr Commons-vakten” den här veckan. Och noterade att natten mellan söndag och måndag visades våra bilder på The Commons för den 200 000:e gången. Kanske undrar du vilka som varit mest populära och då kan jag av en händelse visa just det här och nu. Den blåa Stockholmsbilden har visats 7 805 gånger och är den i särklass mest populära bilden. Fiskaren och Flöjtspelaren har visats 3 600 respektive 2 700 gånger. Berättande bilder, miljöer med mänsklig närvaro, stämningar och porträtt är populära bilder. Förvånande? Nej, knappast. Vi tänker lägger ut fria bilder till en början men på sikt skulle det vara intressant att titta även på andra bilder där vi äger den ekonomiska rätten. Jag hoppas att andra institutioner inspireras och lägger ut sina egna bilder på t ex Flickr.